Point à la ligne: Know your food! You’re at the supermarket and you have a choice between a whole range of breakfast cereals. You pick the one you love or the one that attracts you the most. Did you ever think of looking at the back of the box and comparing items by their nutrition facts? Nutrition facts are not only for dietitians or health professionals! Oh yes! They are yours, dear consumers. I insisted on posting this article soon enough so you can simply… Know your food! Sometimes, reading labels can also prevent you from eating certain foods you had no idea were that rich in calories, fat or sugar. 1. Start by looking at the serving size and the number of servings in the package. The serving size will let you compare two similar products and the number of servings will allow you to calculate the total amount of calories in the product. The Macaroni and Cheese label we have above says 2 servings of 250 calories each. This means we have a total of 500 calories inside the package! 2. Check calories: It’s important to know how much calories you’re having from that food product so you can integrate them in your daily intake. 3. The nutrients indicated in this section are fat (saturated and trans, both bad types of fat), cholesterol and sodium. They are consumed enough and even in excess. Limiting them is recommended as they increase the risk for heart disease, high blood pressure etc. 4. These are the nutrients people don’t usually get enough of although they improve health and prevent certain diseases. For example, choose foods that are high in fibers as they reduce the risk for constipation and heart disease. Get enough calcium to prevent weak bones and eventually osteoporosis. 5. The footnote always contains the following sentence: “Percent daily values are based on a 2000 calorie diet. You daily values may be higher or lower depending on your calorie needs.” The rest is optional depending on the size of the package. It provides you with the amount of nutrients needed for a certain number of calories. 6. The % Daily Values: they tell you how much the food product is providing you with a nutrient compared to the daily recommendations (based on a 2000 calorie diet). Even if you consume a little less or a little more than 2000, you can always use them as a reference to know the nutrient density of the food. And as it says above, 5% or less is low and 20% or more is very high in the nutrient. 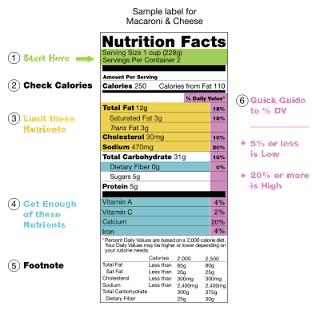 For example, the label we have above provides with 18% of fat per serving. This is not very high yet. However, the entire package contains 2 servings, which means 36% of fat. Now if you’re eating that alone, it becomes very high! As you’ve probably noticed, there are no percentages next to trans fats, sugars and proteins. It seems that experts could not determine the recommendations for the first two. As for proteins, their intake is not considered as a public health concern. Lower in fat or reduced fat: it’s a good thing for a product to be lower in fat. However, it doesn’t mean that we can have this food “a gogo”. It may be reduced in fat, but we don’t know how rich the original product was. Low fat: sometimes, low fat products can be high in carbohydrates or sugars. So it’s not enough for a food to be low in fat, it should also be low in calories. No cholesterol: I’m surprised that in some vegetarian products such as vegetable oils, manufacturers write this claim very proudly. News flash! Vegetarian products do not contain cholesterol! In contrast, the saturated fats and trans fats they may have can raise blood cholesterol. So don’t be fooled. Always look at the saturated and trans fats content. No added sugar: diabetics are the most vulnerable to this type of claims. When they see “no added sugars” on a jar of jam, it means it’s perfectly safe for them to eat it. The thing is, the product may contain sugar in its original composition, just like it’s the case for jam. The fruits it is made of contain sugars. That’s why they should limit themselves to a reasonable quantity. Sugar free: some chocolates, especially made for diabetics, are sugar free. But, they are not low in calories and are not intended for people trying to lose weight. Although the sugar is replaced with an artificial sweetener, the fat content is still very high. So no need to go for those products unless you really need them due to a certain condition. You can have regular sweets in smaller quantities. What you read on a label is often an attempt to sell the product instead of informing the consumer. That’s why you need to read carefully so you can pick the right food. Love this! Thank you so much for clarifying.. I always have a hard time trying to understand this small information box on packages... Can we always trust what's written on it though? glad you found it useful maya! In general, you should trust the information you find on labels. Unfortunately, some products such as mixed nuts from the roastery or some kinds of kaak have one label for all the products and they're not very accurate. try to avoid those kinds of foods and go for known and more reliable brands. Consumers must be vigilant in buying food products by checking nutrition labels. I’d love to share your informative blog with my friends. I use to bypass the nutrition content of the foods that I eat. But my Long Island weight loss center told me that I have to watch my diet. Thank you for this information! You also have to pay focus on the bezel. Divers have to see the amount time they have been under the river, so it is crucial Cheap Replica Watches Australia that your diving watches have a very unidirectional elapsed timing bezel. A specific face in divers watches is vital also. The crystal clear face permits you to quickly glance at the face replica breitling watches in the watch and pay attention to your occasion. If you can't knockoff Hublot watches quickly check imitation Panerai watches out fake Bell & Ross watches your occasion, you may possibly overstay end of it. You should pay focus on the durability in the dive designer watches. Another issue to take note of is your accuracy. You will probably want to look at the strength of the technical scuba divers watches into mind.